Hello crafty friends, and welcome back! 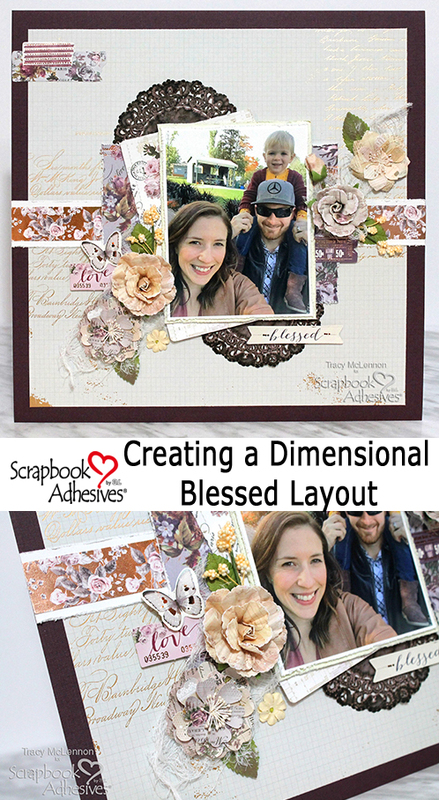 Tracy here, and today I am going through how I create scrapbook layouts with dimension. I’m also sharing some tips and tricks to do so. 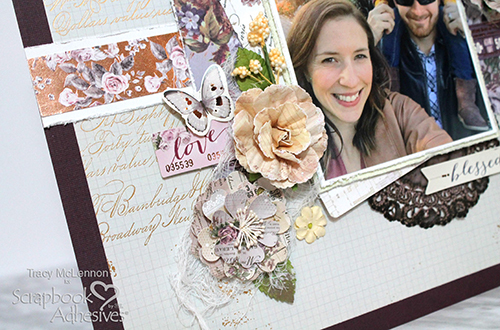 I absolutely adore creating dimensional, full of texture layouts. I admit, sometimes they don’t fit wonderfully into albums. But, for example…this layout is one that I created as a gift, and its final home is in a shadowbox frame, given to a dear friend. My first step is to create the layers of the background. When I know that am creating a dimensional layout, having a good solid base is very important. So to create the backdrop I use my E-Z Runner® Grand Refillable Dispenser paired with the E-Z Runner® Grand Ultra Strong Refill. That way I know whatever I put on top of it, no matter how heavy, the background will be firmly and permanently attached. Once I have the background sorted, I want the matted photo to stand out. 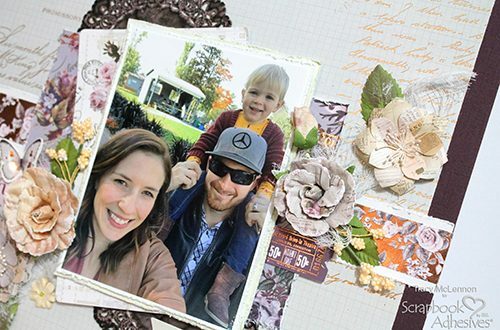 Using 2 layers of Crafty Foam Tape White for extra height, I add the photo to the layout. 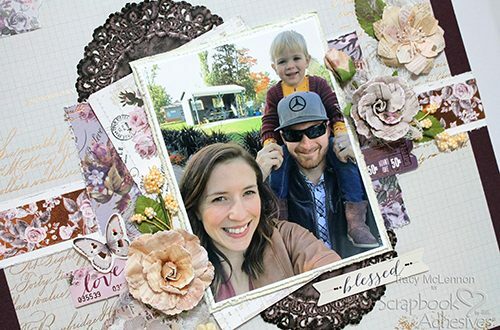 Doubling the Crafty Foam Tape White makes sure that the matted photo doesn’t get lost below the dimensional flowers. Next come to the flowers, cheesecloth, and other small embellishments. Pull out your Adhesive Dots!! I start by laying out the flowers and embellies where I would like them to live. 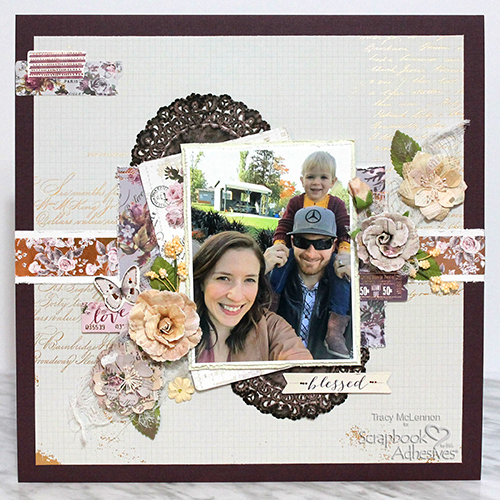 First add the cardstock die cut embellishments using 3D Foam Squares White Mix. Then use Adhesive Dots Medium for the larger flowers and Adhesive Dots Small for the smaller flowers and leaves. Anywhere that I have the cheesecloth, I did double up the Adhesive Dots Medium, this ensures that the cheesecloth stays put on the layout. This entry was posted in 3D Foam Squares, Adhesive Dots & Lines, Adhesives, Crafts & Tutorials, Crafty Foam Tape, E-Z Runner® Grand, Intermediate, Permanent Adhesive, Scrapbook Page, Scrapbooking, Skill Level and tagged 3D Foam Squares Mix White, 3D Foam Squares Regular White, 3D Foam Squares Small White, Adhesive Dots Medium, Adhesive Dots Small, Crafty Foam Tape White, E-Z Runner Grand Dispenser, E-Z Runner Grand Ultra Strong Refill, E-Z Runner Permanent Strips, Flowers, Prima Marketing, Scrapbook Page, Tracy McLennon. Bookmark the permalink.